On May 17th, OFG volunteers, Midtown Community Council, and Loma Vista School worked on demolition and removal of sod, hedges and bushes and major grading at the school. 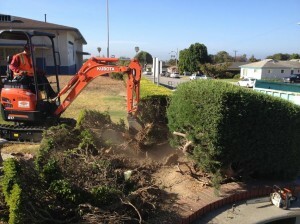 VCMC workers brought equipment and worked hard all day with other volunteers so much progress was made. Next kid friendly and all hands on deck half workday is Saturday, June 7 from 8 a.m. to Noon. 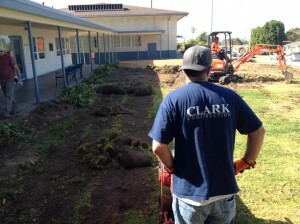 We will be hand digging where the sod was in order to remove grass and weed tubers. 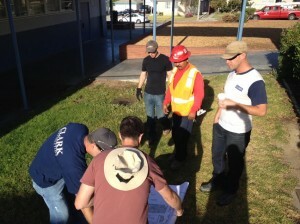 Many hands are needed to make quick work to get ready for the following work day on June 14. Any time you can help whether an hour or all morning will be helpful. 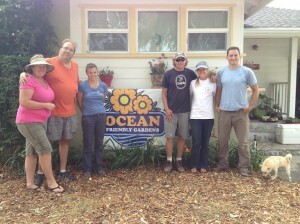 Surfrider Ocean Friendly Gardens committee members will be there for anyone who has questions about the OFG Program and on how to convert their own landscapes into OFGs! Refreshments will be served and pizza at noon for all participants. On May 10th, homeowners Betsy and Scott Manninen began their OFG retrofit when family and friends dug out the turf. It was left to be watered for two weeks to see if any grass re-sprouted. On May 24th, any grass that came back was ripped out and the yard received the sheet mulching treatment, to then be put to bed until September for an OFG garden installation. Stay tuned for information on upcoming Lawn Patrol in July and OFG workday in September.